English lawyer and professor of political economy; born in London March 17, 1819; died there June, 1873. He was the elder son of Solomon Jacob Levy (who adopted the name of Waley), and was educated at Neumegen's school at Highgate and at University College, London, where he was the first pupil to obtain the Flaherty Mathematical Scholarship. In 1839 he was graduated (B.A.) from the University of London, taking the first place in both mathematics and classics. He was entered as a student at Lincoln's Inn on Nov. 3, 1837, and was called to the bar Nov. 21, 1842, being the fourth Jew to be thus called. Waley became one of the most eminent conveyancers of his day. His first studies in conveyancing were conducted in the chambers of Duval; and he was also a pupil of Holt, afterward lord chief justice. 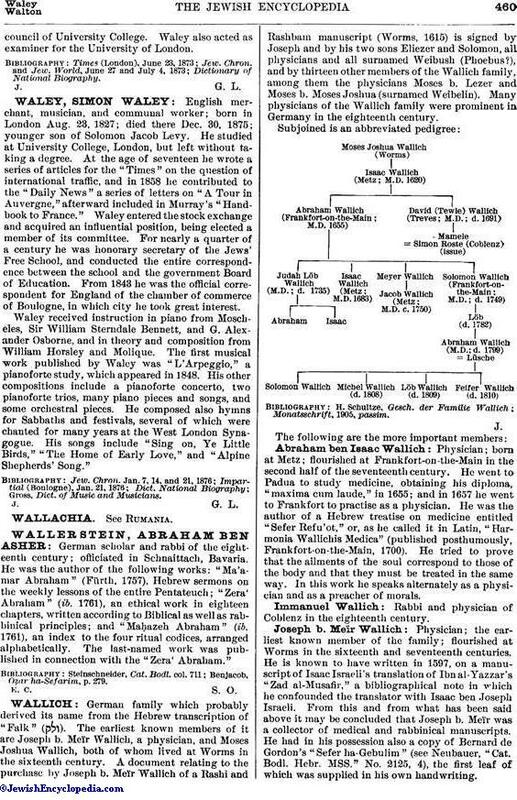 Waley practised as an equity draftsman; he acted as conveyancing counsel for the Bedford estates, and was named by the queen in 1867 a member of the royal commission appointed to consider the law on the transfer of real property. In this capacity he had a large share in framing the report on which was based the lord chancellor's bill passed in 1874. He was associate editor with Davidson of a work on conveyancing precedents, and attained the distinction of becoming (1870) one of the conveyancing counsel of the Court of Chancery. 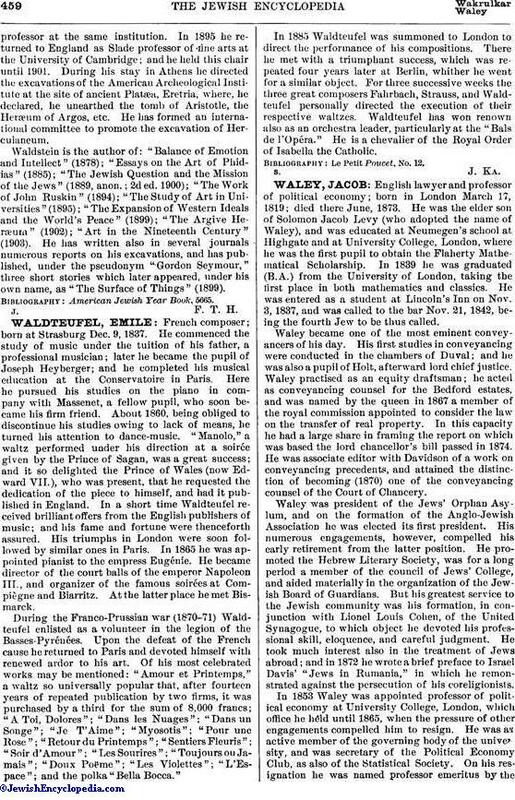 Waley was president of the Jews' Orphan Asylum, and on the formation of the Anglo-Jewish Association he was elected its first president. His numerous engagements, however, compelled his early retirement from the latter position. He promoted the Hebrew Literary Society, was for a long period a member of the council of Jews' College, and aided materially in the organization of the Jewish Board of Guardians. But his greatest service to the Jewish community was his formation, in conjunction with Lionel Louis Cohen, of the United Synagogue, to which object he devoted his professional skill, eloquence, and careful judgment. He took much interest also in the treatment of Jews abroad; and in 1872 he wrote a brief preface to Israel Davis' "Jews in Rumania," in which he remonstrated against the persecution of his coreligionists. In 1853 Waley was appointed professor of political economy at University College, London, which office he held until 1865, when the pressure of other engagements compelled him to resign. He was an active member of the governing body of the university, and was secretary of the Political Economy Club, as also of the Statistical Society. On his resignation he was named professor emeritus by thecouncil of University College. Waley also acted as examiner for the University of London.